HorizonCore’s DevOps consulting services are designed to guide organizations to a model of continuous delivery. This approach allows our customers to get an application into their users’ hands more frequently and reliably by fully automating deployment pipelines. While continuous delivery is the organizing concept around our DevOps services, it is not an end state. Our goal is to equip our clients with the technical skills, complete-tested processes, and tools needed for delivery improvement. Overall we made such efforts that, our customers are able to measure improvement in two specific ways: reduced cycle time (time to reach the customer) and improved product quality. DevOps – a combination of “development” and “operations” is a software engineering culture and practice that aims at unifying software development (Dev) and software operation (Ops). This process is developed to reduce development cycles, increased deployment frequency, more dependable releases and in close alignment with business objectives. It is the combination of cultural philosophies, practices, and tools that increase an organization’s ability to deliver applications and services at high velocity. This speed enables organizations to better serve their customers and compete more effectively in the market. In today’s emerging technology markets, the expectation of customer is hiked. They ask for the best quality in the expected time period. In certain cases companies has lost their business just because of lack of continuous improvement in product and were unable to provide better customer experience. The time has gone were companies made wait to release a final product for 18-24 months or more. Today it is required to get the product out the door as fast as possible. To make this only along with Agile development technique we need to adopt DevOps. It is the smartest way to boost up your development process, quality of service. DevOps deal with Software Development & Operation at a time. Planning is a tough busyness function and important as well. To follow DevOps method it is very much important. Businesses require well defined release planning and management processes that drive release roadmaps, project plans, and delivery schedules, as well as end-to-end traceability across these processes. 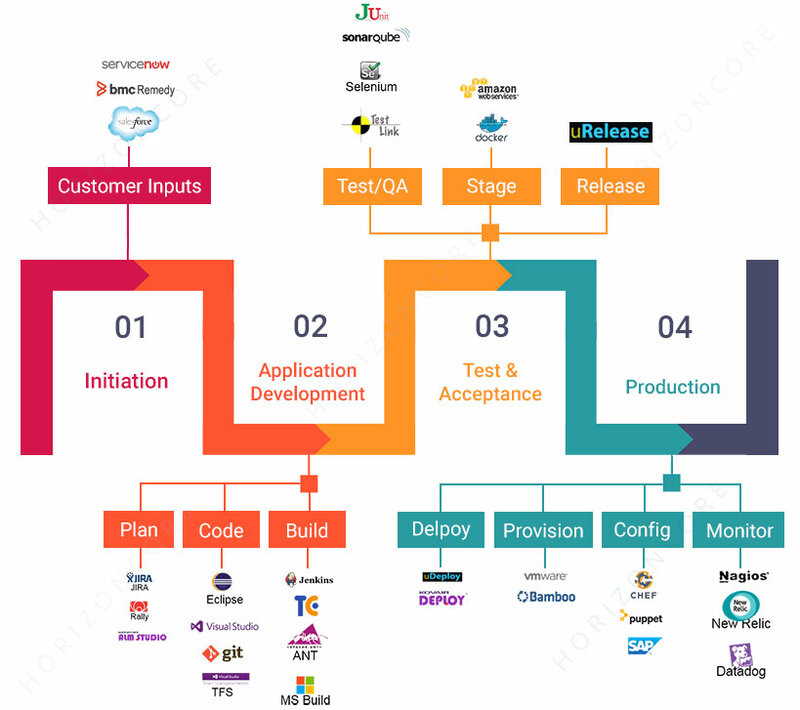 Continuous integration phase is the key element of DevOps as it allows a large team of developers to work on cross technology components at multiple locations to deliver the product in time. Because of Continuous integration, it could be possible to deliver the product continuously by adding the automation in the remaining process like deployment of the software to the testing, system testing, staging and more. Generally, as per the DevOps methodology, the same automated process is used in all environments to improve efficiency and reduce the risk introduced by inconsistent processes. Continuous testing is the art of sprinkling testing into every layer of the software product, and every part of the development process. Product managers, testers, and developers get together to test stories and requirements. Continuous Testing plays a crucial role in Continuous Delivery. It implicates usage of methods and concepts of agile development for the testing and QA process, offering more efficient testing process. 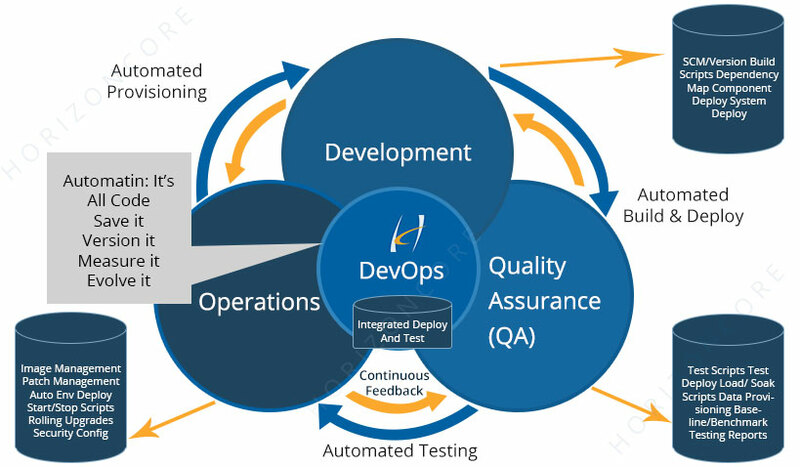 Continuous Testing needs automated end-to-end testing solutions that integrate existing development processes while excluding errors and enabling continuity throughout SDLC. It is also an important part of a development that feedback and requirements received from customers or users should be monitored properly. Feedback comes in different forms, like tickets opened by customers, JIRA, formal requests for changes, complaints, and ratings in app stores. These processes also need to be agile enough to adapt to market and regulatory changes. It should be diagnosed and forwarded to the suitable process for correction or development. AnsibleWorks, Chef, Puppet Labs, Jenkins, TeamCity etc are the DevOps tools for that you should look if you are a new startup or a small business group. HorizonCore has adopted the DevOps with its own innovative nature. We found Jenkins more compatible with our development process. Continuous development, integration & testing are that kinds of words that sound too easy but when you started implementing in your ongoing process it is tough at the initial level. But once you set down with the process flow and received positive results it increases the verve for innovation. With the strength of DevOps tool, HorizonCore is capable enough to carry out any expected result at a specific time frame if its a matter of productivity & business. Feel free to knowledge share or any other inquiries mail here to HorizonCore. Hire a dedicated developer from HorizonCore for any web application development.